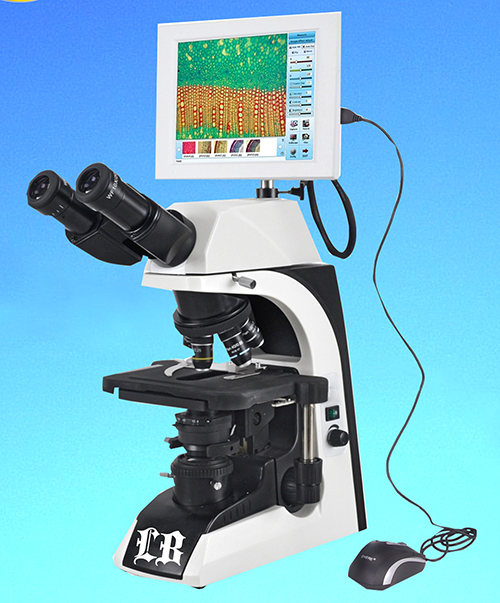 LB-1262 Compound LCD Digital Biological Microscope with Infinite Optical System (Infinity Color Corrected System), LED Illumination and Software (2.0MP) is a wholly new generation microscope system that has an embedded system. With an 8.4” TFT screen, it works like a computer. You can take photos, take videos and make measurement on the machine. With W-LAN and LAN function, you can directly connect the microscope in to the internet. Then you can transfer the images and videos to remote places. The LB-1262 LCD digital microscope is a new generation microscope that with an embedded operation system WinCE 5.0, it can link mouse or keyboard, just like a micro computer. It supports 100M Ethernet network, WI-FI wireless net and can communicate with remote PC. With 8.4 Inch TFT touching screen, friendly man-machine interface, multiple peripheral interfaces and powerful processing function, make it very easy to operate. It can be used in various optical micro fields, such as teaching, biological and medical researching, electronic components inspection and so on. The screen can be separated from the microscope and placed anywhere you like. With LCD Screen and data remote transfer function, this wonderful LCD digital microscope LB-1262 can be used in high level laboratories and universities for teaching, biological and medical research, it also can be used for electronics, circuit board and other industrial inspection.